WHAT A DAY!!!! WHAT A DAY! it was a day we had been planning for weeks, codename "mission catch my girlfriend her first salmon" was in full effect, and it was set into motion early on the 31st. rmrasucher is a good friend of mine and we have been slaying blackmouth together for a long time. with his help, we made this mission an overwhelming success. Rmrauscher and I spent days planning out the route and patterns, and after creating a solid game plan, we hit the water on the 31st with lines in the water at 9 on the water. 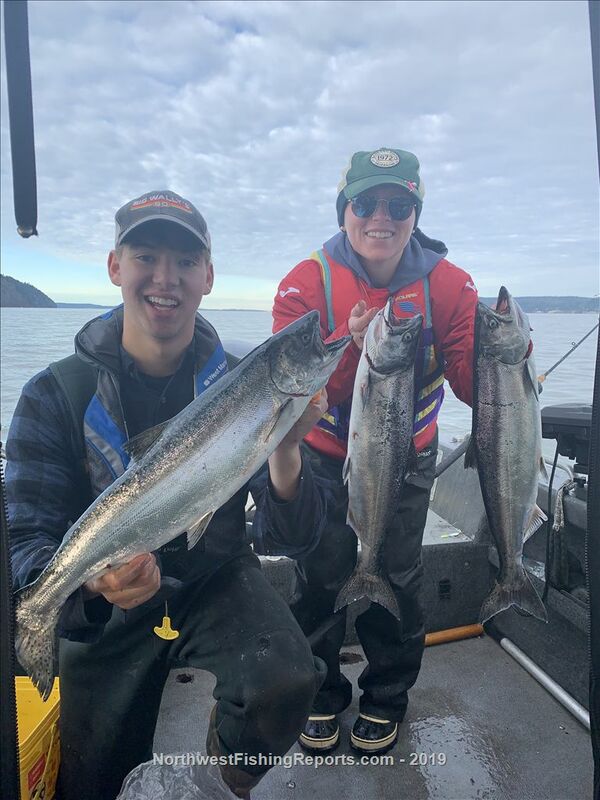 within an hour we had Ryan (my girlfriend) on her first keeper chinook. what a start! from there, the day just went off. we got 2 more with Ryan limiting out on 2 fish that were 22 and 24, with one more coming in at 23. we also caught a small coho and 2 shakers. all this in just 3 hours!! Camano head was the place to be. we checked out racetrack and hat island, but all fish came in 60-80FOW right on the bottom. flashyfish cookies and cream spoons were the hot ticket, with one fish also coming on a custom tied Rmrauscher special spinner with a flashyfish blade. it was an incredible way to get my girlfriend hooked on the saltwater. she is an avid angler in the fresh, and now has the total salt addiction! tight lines as most of the salt opens! wishing everyone success out there. Great job!!! The tug is the drug!